Samuel Segura Cobos held the Pierre du Bois Scholarship from 2013 to 2014. Samuel, a Mexican citizen, holds a BA in International Relations from Tecnologico de Monterrey. He obtained a Certificate in International Politics from the University of British Columbia and a Master in International Relations from Macquarie University. 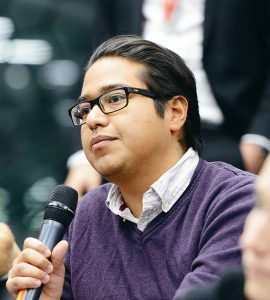 After working at Amnesty International Mexico, Samuel moved to Geneva to pursue a Master in Development Studies at the Graduate Institute. In 2013, he began his doctoral studies at the International History Department. His research focuses on the emergence of export credit agencies in the London and New York financial markets during the first half of the twentieth century. Following a year of support from the Pierre du Bois Foundation, his research project was awarded a Doc.CH grant from the Swiss National Science Foundation in August 2014.